When developer Dontnod announced it was working on a new title in the Life is Strange series which would focus on brand new characters, I – along with a lot of the fanbase – felt a mixture of excitement and concern. This came from a fear of the unknown. What is the franchise without Max and Chloe? Is it possible to connect with future characters on the same intimate level? However, these worries became obsolete within the first five minutes of playing Life is Strange 2. I once again sank into the familiar world of teenage angst and friendship, and immediately began to connect with the new characters – brothers Sean and Daniel. We sat down with lead writer for the Life is Strange series, Jean-Luc Cano, at EGX 2018 to talk about what the essence of Life is Strange is, navigating the tides of adolescence and bottling brotherly love. Beware, spoilers ahead for episode one of Life is Strange 2. The biggest difference between Life is Strange and its sequel is the characters themselves. 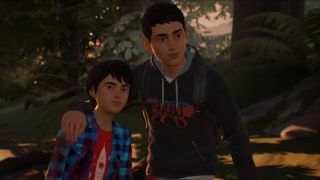 Rather than focusing on white, female, teenage protagonists, Life is Strange 2 tells the story of the Diaz brothers: Sean (16) and his younger brother Daniel (nine). Although many fans struggled with the break away from Max and Chloe, the Dontnod team felt the change was organic and there was a new story to tell. "When we began to work on Life is Strange 2, the first question we asked ourselves was 'what is Life is Strange as a franchise?'" lead writer Jean-Luc Cano explained to TechRadar. “We discussed it a lot, and we feel that Life is Strange is about relatable characters, everyday problems and big questions, social themes we want to explore and a little bit of supernatural stuff on top of that. “We didn't think about doing a story which would please the community. If we look at what the community want, it's more Max, Chloe and Arcadia Bay. OK, I totally understand that but for us the story of Max and Chloe – we have no more to add. Maybe, in a few years, but for now the story is over." This change of characters and story brought with itself a new set of challenges. How do you capture the relationship between brothers and make it believable narratively? Playing episode one, it feels as though the team truly captured what feels like a true sibling relationship – the fights, the pestering, teenage angst vs childhood innocence and, most importantly, the underlying love that cements this bond. There’s no greater example of this than the crux of the story itself (look away if you don’t want spoilers). After the tragic incident at their home which resulted in the death of a policeman and their father, Sean – as the older brother – makes the decision to scoop up Daniel and head out on the road. His reasoning? He knows Daniel is responsible for the incident, and he’s hard-wired to protect him and keep them both together rather than being shipped off to foster care. As Sean battles back and forth with whether or not to tell Daniel the truth about their father – you feel for him. He wants the best for his brother and Sean’s childish ignorance about the situation leads to him constantly ask where their father is and wanting to play games or skip stones – not realizing the inner turmoil Sean is experiencing. On top of this Sean, as the older brother, has the responsibility of being a role model for Daniel - with his (and therefore your) actions shaping both the story and his younger brother’s behavior – despite Sean simply wanting to do what other teenagers do: drink, see his friends and talk to girls. According to Cano, this feature becomes even more prevalent in episode two. I think when you are true and sincere, the story you are writing will touch people around you. The relationship between brothers is new territory for Dontnod in both a development and reality sense. Jean-Luc explains that he only has a little sister, while game directors Michel Koch and Raoul Barbet are the only male sons in their families, so fabricating a brotherly relationship was something none of them had truly experienced first-hand. So what is it about the Life is Strange franchise – a title teetering between AAA and indie - that appeals to people of all ages, sexualities, genders and races? "I think it's maybe because it's linked to the DNA of what Life is Strange is,” Cano tells TechRadar. “We are dealing with subjects that are universal, so everyone can relate to our characters. So even if you are a man, you can relate to Max or Chloe, and if you are a girl you can relate to Sean and Daniel. If you are older, have a little brother – or not – you will experience the main struggles Sean has in Life is Strange 2. "I think it's one of our strengths at Dontnod – to create characters and stories which can touch a lot of people. It's maybe because we are... sincere. The story of Life is Strange and Life is Strange 2 means a lot to us. I think when you are true and sincere, the story you are writing will touch people around you."